What does your list of resolutions for 2016 look like? Something like this? Teach the kids good money habits. Sorry, you’re on your own for the first two. But I can help you nail number three. How? I’ve been collecting tips throughout the year from the best family finance articles on the Internet. I’ve listed my favorite ones below. Just circle a few tips that make the most sense for your kids, and pop them on your list. Break down the total cost of car ownership. Most teens don’t think about all of the ancillary costs that go into owning a car. Use this handy Cost of Automobile Ownership infographic to kickstart the conversation. If your teen has a specific car in mind, you can delve a bit deeper with Edmund’s True Cost to Own Calculator. Explain how overdraft protection really means stiff fees. What’s worse? A little embarrassment at the checkout counter or a $30+ overdraft fee sucked out of your account? Most teens I know will opt for the former every time. Make sure your teen knows that overdraft protection is one of those things that sounds good, but really isn’t. Some college kids pay as much in overdraft fees annually as they do on books. Crazy. Walk through a real tax form. Yours, a teacher’s, or your teen’s from a summer job. Be sure to send more than just negative messages about taxes to your kids. Open a Roth IRA and provide parent matching. Opening a Roth IRA is a brilliant move for your kids. It encourages work and rewards long term, patient investing. I could also be a life changer when it comes to your kid’s retirement. Looking for an investment? See #13 below. Let your kid audit your credit card bill. Would you let your 11 year old audit your credit card bill? How about letting your teenager pay the bills? Ron Lieber explains why you should err on the side of family finance transparency. Make your kid do some chores (without pay). Making kids do chores is falling by the wayside, crowded out by ever-escalating college resume building activities. That’s a shame, because other research shows that giving kids household chores at an early age pays all kinds of positive dividends from self-reliance to empathy. Is it time to start reevaluating our kids’ priorities a bit? P.S. let your kids know the sixties style striped bell-bottoms are optional for best results! Use when-you-do-X-do-Y triggers to make chores a habit. Is your chore system broken? Do you rotate chores? You might just need to establish some simple, consistent when-you-do-X-do-Y trigger rules to make the habits stick. Turn chores into a team activity. There’s no “I” in team. You might have better luck with chores if you turn them into a team sport where everyone plays the whole game. Try it with the dinner cleanup routine. Make the kids make dinner. Having the kids make dinner for the family once a week is a great exercise on lots of different levels. It builds appreciation, pride, and basic life skills. Bonus: it saves money too. Embrace your budding artist. Remind your kids that high paying professions don’t guarantee happiness. Your college-bound kid says, “I want to be an artist!” You say...? Wait, read this article first. Roughly 70% of professional artists like their work, while roughly 70% of executives, doctors, teachers and other workers don’t. Hmmm. Share the secrets of the Millionaire Next Door: modesty, thrift, prudence. How do most of the rich grow wealthy? Two men set out to answer that question with research. They co-authored their findings in the blockbuster book “The Millionaire Next Door,” and the results may surprise you. One of the authors, Thomas J. Stanley, died in 2015. This article tells the fascinating back story of the book (which originally had the working title “Big Hat, No Cattle”) and the tragic, ironic circumstances of his death. Teach your teen what a low cost index fund is. In 1975, Jack Bogle created the first index fund that was accessible to the public. By doing so, he allowed the “average Joe” to participate in the profits of capitalism in a simple, highly diversified, low cost way. In short, he democratized investing and created one of the best long-term investing vehicles available to people of all wealth levels — including teens with Roth IRAs (see #4). Tweak you allowance strategy using Lieber’s research. You’re Doing Allowance Wrong. Start early. Split into spend, save, give buckets. Make it a budget unrelated to ordinary household chores. Expand the budget and responsibility as your kid matures to eventually cover needs like clothing, sports, music, etc. Say grace at family dinners even if you don’t believe in God. Why? It’s a very simple way of consistently expressing gratitude. More gratitude correlates to higher grades, more life satisfaction, more social integration, less depression, and less envy. (More info on the benefits of gratitude here.) Need a non-religious grace ritual? Try ours: hold hands and simply say: “For what we are about to receive, may we be truly thankful.” That’s it. Short and sweet. Push your state to require personal finance instruction in school. Recent research shows mandatory personal finance courses in high school lead to higher credit scores and fewer missed payments. Besides, it just makes sense to teach kids basic personal finance concepts in school and in the home. Tell your kids how much you make and what life costs (gradually). Keeping money matters a dark secret isn’t going to do your kids any favors. In fact, quite the converse. Come up with an age-appropriate game-plan for progressive disclosure of your family finances. Your kids deserve to have a financial clue before heading off to college. Send your kids regular financial text messages to nudge smart behavior. Simple, frequent financial “nudges” sent via text message are a proven method to improve financial education. That’s one of the reasons we send lots of notifications from FamZoo about remaining balance after a purchase or interest earned on savings. Pay your kid a 10% annual savings rate with monthly compounding like Mr. Money Mustache. The famed personal finance blogger is teaching his kid the power of compound interest by rewarding his saving with aggressive parent-paid interest. He calculates it in a spreadsheet, and I created a Google docs family bank sheet that will allow you to do the same. Make your kid pay for cell phone overage charges or a portion of the monthly fee. Too many kids grow up thinking that shared services like cell phones are free. Make sure your kids share some skin in the family plan by allocating some of the costs to them each month. Agonizing on whether and when to get your kid a cell phone? This post will help you frame the decision and set the ground rules. Get your youngster a prepaid debit card. Deborah Dunham, mom to two teens, describes how and why prepaid cards can be used to teach kids good money habits. If you’re on the fence about the idea of giving your kid a prepaid card, you’ll find this article very helpful in making a decision. A favorite quote: “Reality calls and that means plastic is taking over, so I am opting to teach my son about fiscal responsibility with debit — and hopefully not credit — cards.” I also love the fact that her son made some extra cash pet-sitting a friend’s iguana! Involve your kids in a big family job. Don’t get hung up on the farm example in this article. You don’t need a farm, and the job can be outside the home — perhaps a significant volunteer effort in your community. We get so wrapped up in shuttling our kids around to activities or “just doing it ourselves” that this opportunity often falls through the cracks. Realize that the college application process is unpredictable, opaque, and 94% of the time disappointing. If you’ll be going through the brutal college application process with a child anytime soon, here’s an excellent article for you and your kid(s) to read. The insanity at the top end of the spectrum has definitely reached epic proportions. This article helps put things in perspective a bit. It has wonderful drawings too. Give your kid (fractional shares of) stock or an ETF. 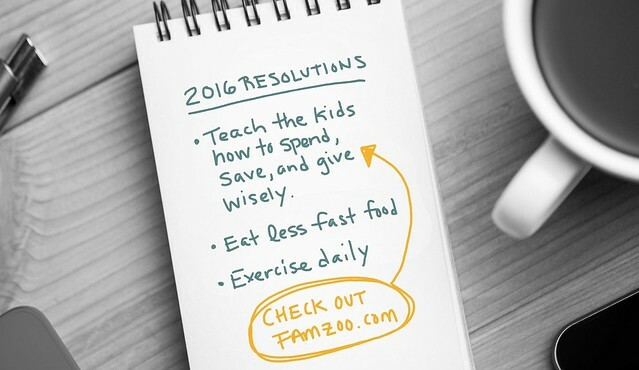 Want to teach your kid about investing in 2016 without breaking the bank? Listen to this interview with the founder of SparkGift on Stacking Benjamins to see how you can give fractional shares of a favorite stock or ETF for as little as $20. For more info and tips about giving stock, see the first item in my recent post about creative financial gifts for kids. Write a money letter to your kids. Sitting down and writing a letter to your kids about money (and values and life) is a wonderful, valuable exercise. Typically, parents do it when the kids head off to college, but there’s no need to wait. Here’s a great example from Brian at Debt Discipline to his 3 teenagers (13, 16 and 16). So, as you’re driving back from In-N-Out slamming your triple double, fries and Neapolitan shake, don’t beat yourself up. Sure, you just sabotaged your efforts on your first two eating and exercise resolutions, but you still have number three in the bag — which means you’re way ahead of most parents. Kudos. One thing I have committed to this year is assisting my kids to earn more money and learn about how to use it, save it, invest it and so on. You have shared great resources for me. Thank you! Kudos for that commitment to your kids, and thanks for stopping by! So many good articles here and great advice for teaching kids smart money habits. Thanks Bill for pulling this list together. You bet Mac - thank you for stopping by and leaving those kind comments. Nice job, Bill. This is great information. Thanks for including me Bill. So important to teach our children as much as possible about money as they begin their financial lives. Bill, great article full of good useful Info. So, shorter answer: I agree with you that teaching kids about the importance of an emergency fund is an awesome thing to do! Im only 18, but i can not wait to teach my kids about personal finance and the value of money. Im going to have them saving and making money before they even know it! Thanks for stopping by "Formative Fortunes" - just checked out your About page where I found: "I’m a college student. Nothing else, I have no degrees, no certifications. I started this blog to share my journey to become financially secure while securing happiness and joy in life. To me I feel that this blog will not only help me plant my roots and began to grow financially stable but I want to share my experience whether good or bad, to help the young and the old and even perhaps inspire them to focus on their wealth and create their own fortune." Very impressive. You're a heck of a lot more mature than I was at 18 :-) Best of luck on your journey! Letting your kids understand how hard it is to earn money helps. Yes, because they would realize that they need to save and spend less. They would have self-discipline when it comes to handling their finances well.